It's the time of year when you need to pull out your Soup As Medicinerecipes. Kids with colds, adults with colds… it's fortify or get sick. This soup is an old staple and firm family favourite. I've adapted it from my grandmothers chicken soup and Donna Hay'schicken meatball recipe. Mix chicken, shallots, breadcrumbs, 4 tablespoons parmesan, 2 minced garlic cloves, egg, 3/4 teaspoon salt and 1/4 teaspoon pepper in a medium bowl. Roll into 'half a gold ball size' meat balls (makes about 20). Heat oil in a pot over medium heat. Cook meatballs until golden, about 3 minutes (they will finish cooking in soup). Transfer to a plate and set aside. Cook chopped leek in a soup pot stirring often, until soft. Add sliced garlic cloves and cook for a further minute. Add stock and 2 cups of water then bring to a boil for about ten minutes. Add carrots and pasta - simmering until pasta is almost al dente. Add meatballs to the stock and simmer gently until pasta is cooked, the carrots are tender and meatballs are cooked through. This will take about 5 minutes. Add remaining Parmesan and season with salt and pepper. 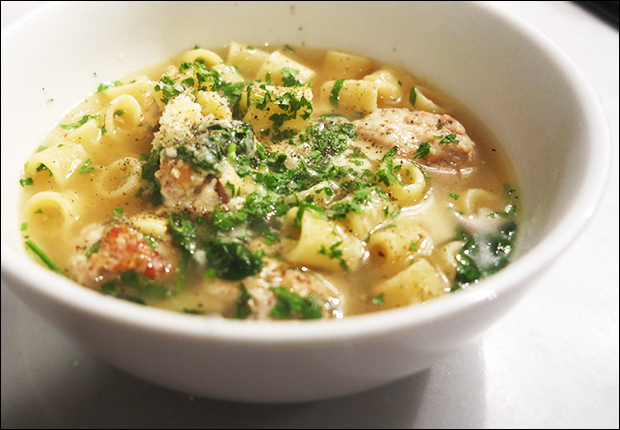 Garnish with chopped basil, parsley and parmesan.